Perhaps you’ve heard that breathing through your nose is “better.” I know I’ve heard it before. But is it really true and what does that even mean? Can nose breathing actually help me perform better on the pavement/court/field? Well, I have news for you — it’s not just better for you physically, but, according to the research, nose breathing is essential to your physical well being, and mouth breathing can actually be detrimental to your health. Mouth breathing can lower IQ, negatively affect your sleep, and thwart the levels of oxygen reaching your brain, which can kill brain cells! On the other hand, practicing nose breathing can lower blood pressure, heart rate, and injury risk. 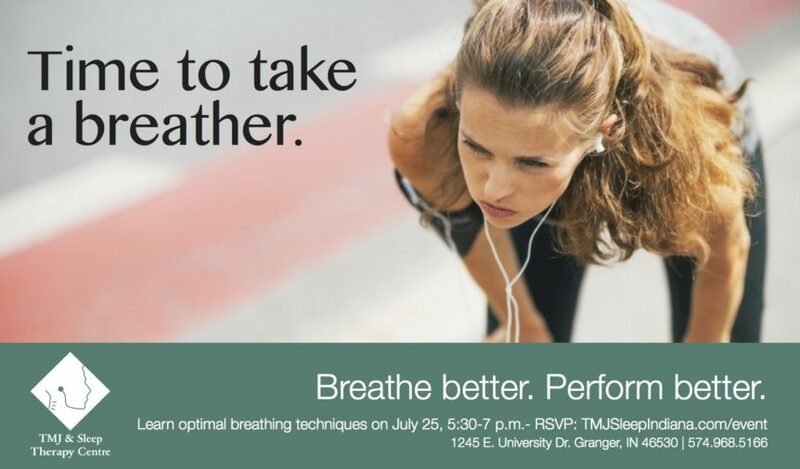 This Tuesday, July 25, Dr. Daniel Klauer will lead a workshop in which he’ll explain why nose breathing is essential to your health. You’re guaranteed to walk away with tangible breathing tests and exercises you can practice at home to improve your quality of life. Dr. Klauer and his TMJ & Sleep Therapy Centre team have worked with many elite high school and college athletes to improve their performance, and at this free workshop, he’ll be teaching us those same breathing techniques. The great news is that this workshop will be tailored to the audience’s interests and abilities, so you’ll walk away with a clear understanding of why nose breathing is important and how you can apply it to your fitness routine. Why is it essential to breathe through your nose? What are the physiological benefits of nose breathing? How does mouth breathing affect facial development? How are nose breathing and injury prevention linked? How can you normalize nose breathing? How does this apply to my [insert your favorite sport/physical activity]? The workshop will be held at the TMJ & Sleep Therapy Centre from 5:30–7:00 p.m. on Tuesday, July 25. Just remember to RSVP to this free event here.